A good bush mechanic can jerry-rig almost any mechanical system to keep it running but the electronics taking over control of modern vehicles are something else. On our drive from Francistown to Khama Rhino Reserve we were privileged to experience both sides of this coin. In trying to follow an old gravel road that was supposed to cut our drive significantly we ended up on a narrow dirt track swerving tightly through thorn trees. After having turned around I managed to wedge the rear passenger side of the vehicle against a trunk that was bending the runner (the board along the side that you use to enter/exit the vehicle). I was able to get us off the trunk using sheer force but the runner had been pushed so far forward that the front tire hit it on every rotation. Using what leverage we could find around (mostly dried up branches) I was able to push it back enough so that the tire only hit when we turned left – which wasn’t a problem since it was a relatively straight 60 kilometers to Palapye. After driving the stretch concentrating on finding a line that limited any leftward movement we pulled into the first service station – conveniently on the right side of the road. The mechanic heard the problem as we pulled in and in no time had his trusty old street sign pole out and, with me holding the tire in place using the steering wheel, easily pushed the runner back enough to not interfere with our driving. On the other hand, I am now driving with four warning lights on my dash fulltime. 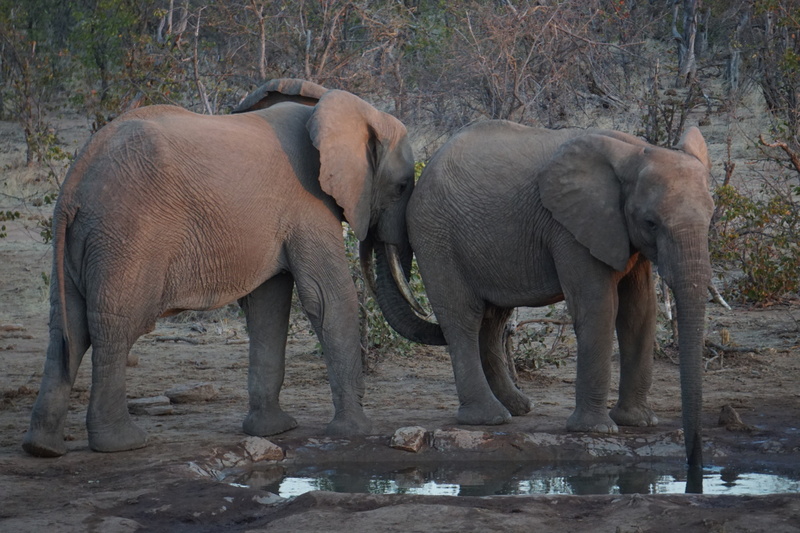 I had been told to expect the fuel system warning light to come on at some point – and sure enough it had back in Hwange likely due to some dirty diesel there. I had not been told to expect my VSC, ABS and brake system failure lights to come on. 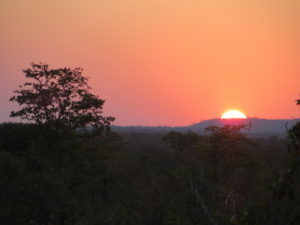 As we pulled into Khama we slipped slightly on the suddenly sandy road and the lights came on. I switched to 4wd and had no problem driving into reception and our chalet, but my notes said to call them if those lights flashed. After buying Mascom airtime for the ranger at reception, since my Orange network didn’t work there, I called Savannah and talked with the head mechanic. “Ah, you got it dirty,” was his response. Apparently, when the sensor or the cable gets dirty the warning lights come on – and won’t go off again until it is reset at the next service. We are lucky, sure we no longer have a meaningful way of differentiating a real problem from our fake one, but at least the car still lets us drive with these warnings on – the real problem in the bush is when the car decides it won’t let you turn it on because one of the electronic systems ‘fail’ even if it is just a little dirt. Of course we wouldn’t let any of that interfere with our own experiences so, despite losing an hour or so, we enjoyed Khama Rhino Reserve. 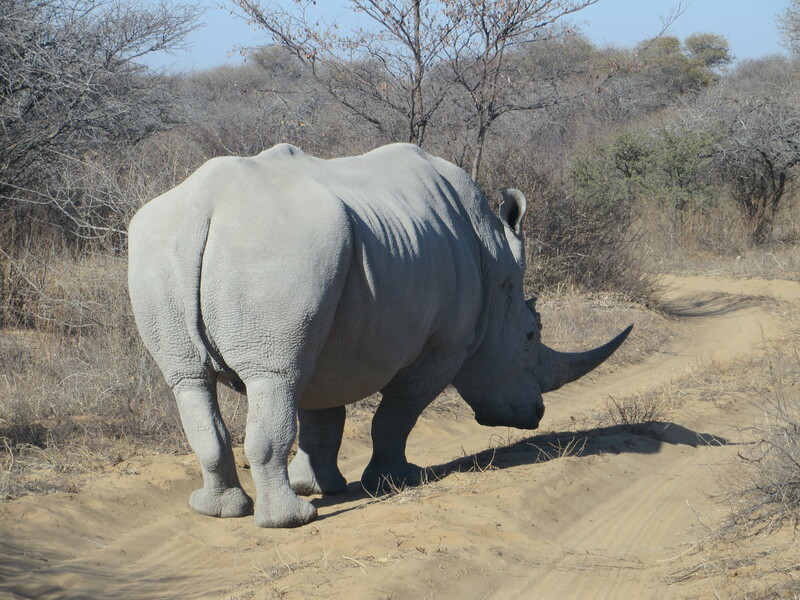 We saw 15 rhino in our day driving around there including a very nice sighting of a female, baby and trailing protective male. We tracked them to where they would cross the road and watched them slowly cross. The male was bringing up the back leaving some distance (having watched rhinos for a bit it seems the males want to claim ownership over the mother/child pair but the mother doesn’t really see it that way), and, taking his time in the road, would not let us pass until he was satisfied the female and child were far enough away. Once he had crossed and started grazing away from the road I proceeded to pass thinking he would be contented but as we pulled up by him he picked up his head, flipped himself around and gave us a nasty look as if he was going to charge – after a slight hesitation, I kept going and he let us be. We even enjoyed Francistown as much as one can enjoy a functional city, stumbling upon the interesting if limited museum and then having a lovely dinner at Barbara’s Bistro, Barbara being one of the local imports (from Germany) whose story was featured at the museum. 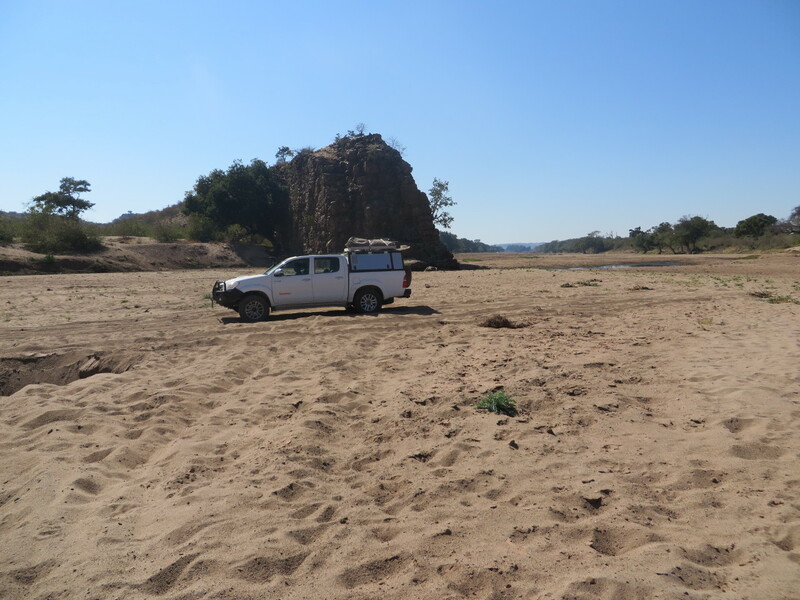 We’ve spent our last few days in Botswana shadowing the Limpopo River (which serves as the border with South Africa) in the Tuli Block – a collection of private reserves interspersed with regular ranches that is rich in wildlife and natural beauty. We have driven ~180 kilometers along the dirt B141 road which pretty much mirrors the path of the river ~10 kilometers in – it is one of the worst numbered roads we have been on in this or any country with few other souls outside of the guy driving the grader making side deals to service the private reserves and ranches – it has had a bit of everything from steep rocky inclines to dry riverbed crossings, it’s been fun. 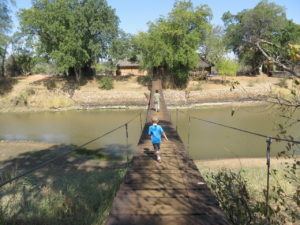 Our stay at Stevensford Game Reserve was very nice – we were lucky that the owners were in and, for the first time, working the Reserve instead of visiting it. They were lovely and engaging, another in the long line of owner/operators who we made real connections with, and allowed us the freedom to drive at night and in the north, wilder, side of the farm (which they usually restrict to those going with their own staff) to ensure we saw springhare – one of the few mammals still unchecked on our list, almost all of which are nocturnal. Springhare are fun animals to watch – they look and jump like mini kangaroos – but the coolest part is when all you see is there eye shine hopping in midair as if they are suspended club lights. We did not get lucky with brown hyena or aardwolf, both of which are seeable there, but did have a great sighting of a leopard on our night drive. As has been typical, they were intrigued by our trip and our response to the accident – they used the word ‘brave’ to describe the choice to continue on; many locals have. I don’t really understand that though – it may have been an atypical response, but I don’t think continuing to travel for a short period where they live permanently raises to any sort of bravery. Our second stop in the area was almost a disappointment. The setting is fantastic – an island camp in the Limpopo, staying in safari tents with the sounds of elephants, crocodiles and baboons (among others) all around. 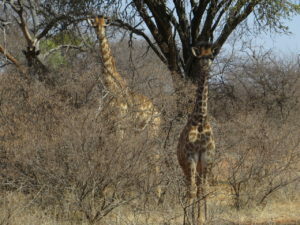 It is very wild (which is why it is called Wild at Tuli) and feels well integrated into the natural surroundings. One of the reasons we came here was because they have a brown hyena den on the property and I was told they would give us the coordinates and let us wait there and hope to see them – unfortunately they weren’t able to deliver on that. After some waiting on the island to connect with them at reception by radio (the only means of communication to the camp – and clearly not a reliable one) they did give us directions to a hide on the north side of their property (which is not usually where self-drivers are sent) where the hyenas are often spotted, and the understanding that we would stay out a little later than they usually allowed so we could come back in the early darkness. We did not see a brown hyena at the hide. We did however see one on the way to the hide and saw that elusive aardwolf on the drive back – both hyaenidae have been central points of discussion the whole trip (brown hyenas because they star in the Cry of the Kalahari which I have been reading to the children and aardwolf because it was of course the name of our first vehicle, may she rest in peace). 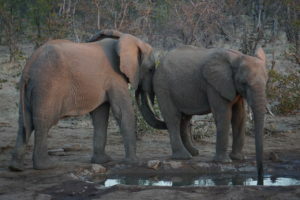 That rescued the early feeling of disappointment and helped us fully enjoy the wild setting as we made dinner in the open kitchen and braai with elephant eating in the distance and the local genet spying our food. Today we are heading across the dry Limpopo at Pont Drift – and by that I mean we are driving across the riverbed (it isn’t where we originally planned to cross this river but it is a river crossing nonetheless). 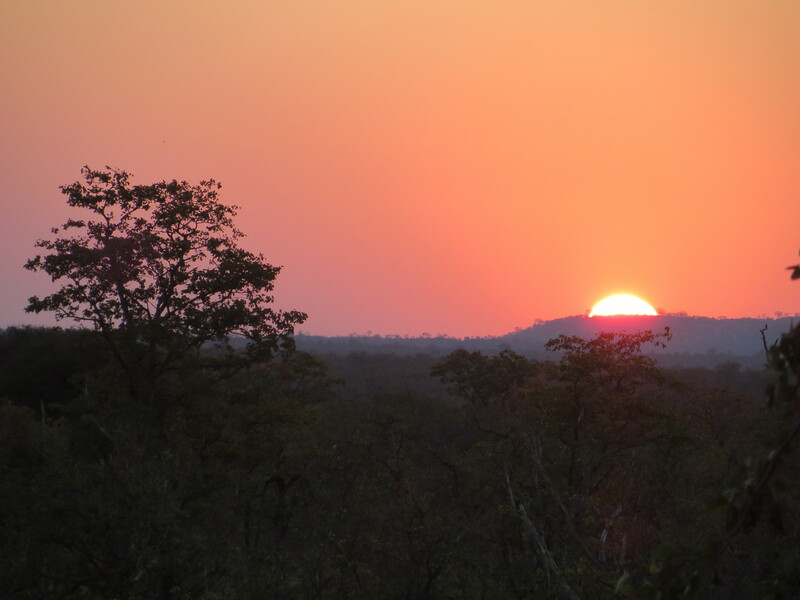 From there we are spending our home stretch in South Africa visiting Mapungubwe, sleeping out at Sable Dam and make our way towards Johannesburg.